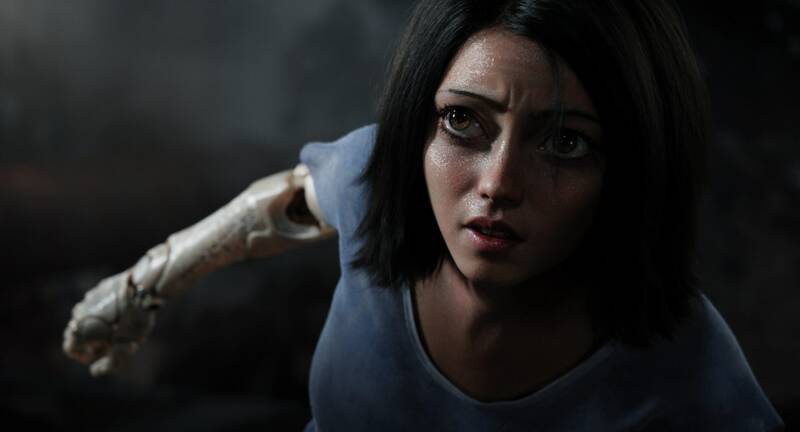 Are you ready for Alita: Battle Angel? The action-packed adaptation of the beloved manga is finally coming to theaters next February thanks to the teamwork of producer James Cameron and director Robert Rodriguez. But as you gear up for the release of this cyborg epic, your brain might be distracted by trying to figure out how you recognize its charismatic cast. We’ve got you covered with a rundown of the stars’ most memorable career highlights. Who’s the girl behind those big anime eyes? Before she was on her way to becoming the leading lady of Alita: Battle Angel, this Cuban-American actress was working the concession stand at a movie theater in Maryland. You might recognize her from her recurring roles on television, playing a murdered nursing student on American Horror Story and the pregnant Zoe DeHaven on Parenthood. However, it’s more likely you know Salazar from her work in YA movie adaptations. With a shaved head and steely glower, she portrayed the tough-as-nails but tenderhearted Lynn in The Divergent Series: Insurgent. Then in the Maze Runner franchise, she scored the supporting role of the sharp-shooting and cunning Brenda. They’re roles that have paved the way for her to play the action-heavy lead of Alita, so it will be interesting to see how she levels up in her first lead role in a tentpole film. The acclaimed Austrian actor began his screen-acting career in the late 1970s. But he didn’t break through in the U.S. until 2009, when he blew away North American audiences as the charismatic yet reprehensible Nazi, Hans Landa, in Quentin Tarantino’s Inglourious Basterds. Waltz earned his first Academy Award for that performance, and a second for his 2012 re-team with Tarantino for the rip-roaring and bloody Western, Django Unchained. He often plays bad guys, as he has in The Green Hornet, the 2001 version of The Three Musketeers, The Legend of Tarzan and Spectre, where he took on the role of Bond villain Blofeld. But in Alita: Battle Angel, we see a softer side to Waltz, as he plays the father figure to its titular heroine. In her youth, Connelly became the envy of generations of teen girls when she starred as Sarah in the Jim Henson fantasy film Labyrinth, which famously starred David Bowie as the alluring but menacing Goblin King, Jareth. She has gone on to work with a string of heralded directors, starring in Darren Aronofsky’s disturbing drug drama Requiem for a Dream, Ang Lee’s cerebral superhero movie Hulk, and Ron Howard’s Academy Award-winning biopic A Beautiful Mind, for which she won a Best Supporting Actress Oscar of her own. But genre fans might remember this American actress for more fantastical fare, like the high-flying adventure of The Rocketeer or the romantic saga of Winter’s Tale. Whether you like action, superheroes or fantasy, you’ve likely spied this smirking English dude before. In 2013, Skrein made his TV debut on Game of Thrones, where he played the original Daario Naharis, saucy consort to the Mother of Dragons. His blade-wielding character was later recast, but don’t cry for Skrein. He made the leap to action hero with The Transporter Refueled, and then gave supervillainy a spin as the maleficent Ajax in Deadpool–or rather, Francis, as both audiences and Wade Wilson know him. By now, Skrein is more than ready to mix it up as a badass bounty hunter in Alita: Battle Angel. If you have a very keen eye, you might recognize Condor from her too-brief appearance as the spark-slinging Jubilee in X-Men: Apocalypse. But most likely, you know this actress as the lovely leading lady from one of this summer’s most popular rom-coms, Netflix’s To All The Boys I’ve Loved Before. Condor won our hearts playing hopeless romantic Lara Jean Covey, as well as having us coveting her cute fashion. In Alita, she’ll channel her charm into playing orphaned teen Koyomi, who is sure to dazzle (even if not through superpowers). This American hunk has over 100 acting credits to his name. But the simple answer to “Why do I know Casper Van Dien?” is Starship Troopers. Paul Verhoeven’s outrageous and R-rated adaptation of Robert A. Heinlein’s satirical sci-fi novel earned mixed reviews from critics and was a box office disappointment. Yet it went on to become a much-beloved cult classic, and it spawned a slew of sequels, including Starship Troopers 3: Marauder and Starship Troopers: Traitor of Mars, both of which saw Van Dien reprising the role of Johnny Rico. TV fans, however, might recognize him from his long-running role as villain Andre Forester on bodyguard drama Watch Over Me. Undoubtedly, you know this Texan actress as Letty, the beautiful badass who stole Vin Diesel’s heart in The Fast and the Furious franchise. Or maybe you remember Rodriguez from the TV mystery series LOST, where she played Ana Lucia Cortez, a brooding former police officer who stirred up plenty of trouble. She’ll be bringing all her attitude and bravura to Gelda, a fearsome cyborg-warrior in Alita: Battle Angel, her third collaboration with director Robert Rodriguez. Previously, she appeared in his gleefully violent action flicks Machete and Machete Kills. It’s also her second franchise team-up with producer James Cameron–she played the tough but doomed pilot, Trudy, in Avatar. This dazzling Mexican actress got her start on the telenovela Lola, Erase Una Vez, where she played the titular heroine. González went on to score the role of vampire queen Santánico Pandemonium in From Dusk Til Dawn: The Series, which was conveniently created Robert Rodriguez. But to American moviegoers, she might be known best as “Darling.” That was the codename of González’s sultry and stylish Bonnie to Jon Hamm’s swaggering Clyde in Edgar Wright’s musical heist movie Baby Driver. To genre fans, this Oakland-born actor is probably best known as the regal kingpin Cornell ‘Cottonmouth’ Stokes from Season 1 of Luke Cage, and even if they don’t remember him from that, they’ll certainly remember him for his roles on Treme, House of Cards or The 4400. Or maybe you remember him as Katniss’s bodyguard Boggs in The Hunger Games: Mockingjay Part 1 & 2. But Ali’s got range and has scored acclaim in prestige dramas, as well, playing the dashing love interest in Hidden Figures and winning the Academy Award for Best Supporting Actor for his brief but breathtaking performance in Barry Jenkins’ coming-of-age drama Moonlight. The role of Vector, however, seems most in line with Cottonmouth, as a suited and shady figure who rules the Iron City with an iron fist. You might know the name, but not the face of this esteemed character actor. That’s because his two biggest movie roles involved covering up his memorable mug. In 2010’s Nightmare on Elm Street remake, he played the quipping nightmare-maker Freddy Krueger, boldly taking on the role originated by horror icon Robert Englund, and it called for plenty of creepy prosthetics. Before that, Haley thrilled comic book fans by bringing a seething cynicism to Watchmen as Rorschach, a vigilante crime fighter who always wears a mask over his face. But on TV, Haley’s shown his face and relished in menace, playing the murderous Odin Quincannon on Preacher and villainous Terror on The Tick. We don’t yet know who he’ll be playing in Alita: Battle Angel, but it seems a safe bet he’ll be a chill-inducing baddie.